I was born and grew up in Delhi. Honestly I remember one of my closest friend had severe asthma problems especially during the winters. In Delhi, in winters we have ‘Smog’. Smog is a kind of air pollution, originally named for the mixture of smoke and fog in the air. Classic smog results from large amounts of coal burning in an area and is caused by a mixture of smoke and sulfur dioxide. During the winters, the smog is so thick that you can see anything in your arms distance. Recently, Delhi became the world’s most polluted city in the world. We are number 1 is many ways ( most of the them in a bad way) Highest road accidents, highest diabetics, highest heart problems too. There is nothing to be proud of. I remember my friends from abroad who constantly fell sick or complained about air quality. We have a joke in Delhi of not wearing a white shirt during the summer because most likely its going to turn black by the evening. The article mentioned in BBC is very interesting. In London last week, the most dangerous particles – PM 2.5 – hit a high of 57 – that’s nearly six times recommended limits In Delhi we have these particles at around 300. Thats 30 times more. It is of course going to be like this when you can few hundred thousand vehicles driving everyday on the road, where 18 million people live and most of them use cheap oil o char coal to their work done. I wasnt surprised that when the article mentioned that after heart attach, air pollution is the highest killer in India. Living here in Rimini, Italy has been a luxury in its own way. Al though some people might complain about the air quality of Rimini but for me i cant ask for a better quality than this. 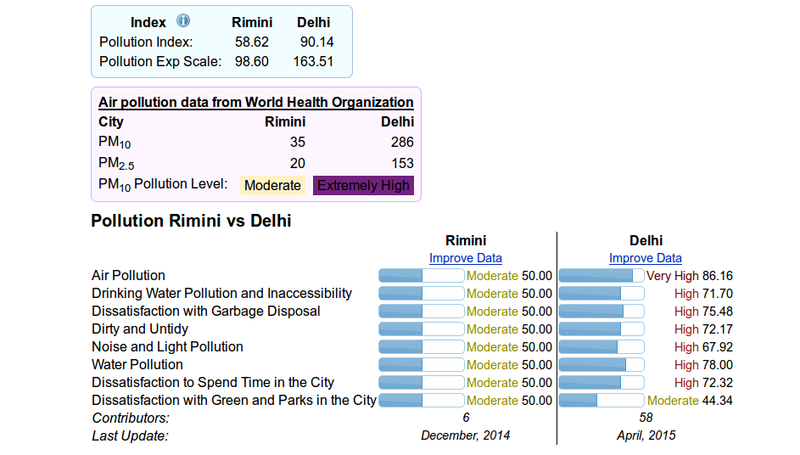 Here this the detailed comparion of Rimini and Delhi.